John Constantine Unitas was born on this day in Pittsburgh, Pennsylvania in 1933. today is the 80th anniversary of his birth. 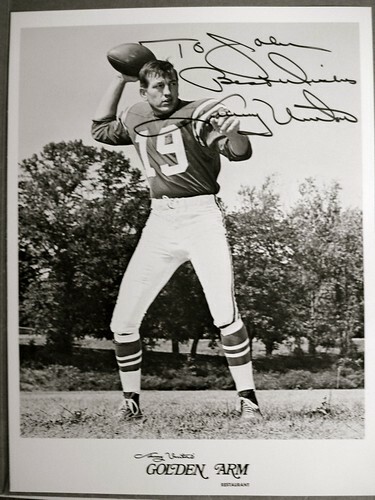 Unitas grew up in the suburb of Brookline where he played halfback and quarterback at St. Justin’s High School. He became a Louisville Cardinal in college when he attended University of Louisville in Kentucky. In 1952 the school tightened academic standards and reduced athletic aid, so the football team lost players on the roster. The coach changed strategy and went with two-way football, and Unitas stepped up his game by playing both defense (safety or linebacker) and offense (quarterback and special teams). In 1956 Unitas and another Bloomfield Ram player, lineman Jim Deglaum, tried out for the Baltimore Colts. He stepped into the role of first line quarterback after George Shaw broke his leg a few weeks into the season. After a rocky start the rookie settled in and took control on the field. Unitas was the Colt’s quarterback for the next 15 years. After retiring from football he did color commentary on CBS and, when the Colts bolted to Indianapolis, he was leading advocate in getting the city of Baltimore a new NFL team. He was often on the Raven’s sidelines when the team came to Baltimore. Unitas died of a heart attack on September 11, 2002. 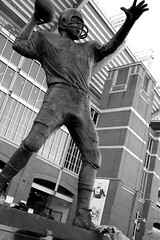 Rub Johnny U’s Shoe (Photo credit: Au Kirk) A statue in honor of Unitas in front of M & T Stadium, the home of the Ravens. This entry was posted on Wednesday, May 8th, 2013 at 12:55 am	and posted in Baltimore, Colts, Football, Johnny Unitas, postaday, Thought of the Day, Today's Birthday. You can follow any responses to this entry through the RSS 2.0 feed.